Immediately after the 2016 US presidential election, Buzzfeed researchers discovered that the top 20 Fake News stories about the election received more social engagement on Facebook than the top 20 news stories from 19 major media outlets. Fake News quickly became a mainstream term, and a major topic of debate. The term ‘Fake News’ is used on both sides of the political debate. On the one hand it is used by those who claim Fake News articles helped contribute to Donald Trump’s election victory. Equally it is used by Donald Trump himself, and his supporters, who refer to the ‘Fake News’ mainstream media. In this post we should make clear we are not looking at examples of Fake News. Instead we are looking at articles about Fake News, such as the growth in Fake News stories or how to identify Fake News or the impact of articles about Fake News. 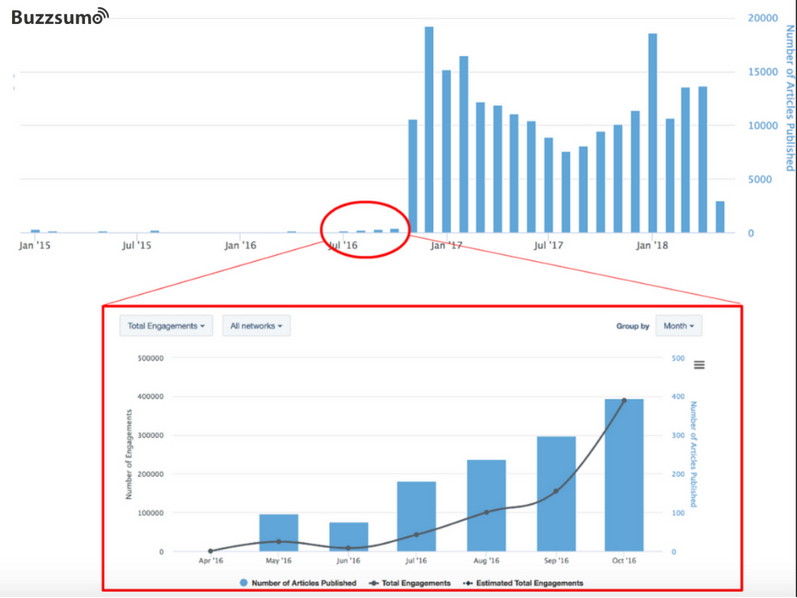 Using BuzzSumo data we have charted the number of articles published about Fake News for the period January 2015 to May 2018. From the chart below we can see there were relatively few articles about Fake News being published prior to 8 November 2016 when the US presidential election took place. In November 2016 we see an explosion in articles. There were over 10,000 articles published about Fake News in November 2016 rising to 19,000 articles in December 2016. The increase in Fake News articles appears to coincide with a jump in interest in the topic from November 2016 as measured by the Google search volumes seen below. In terms of social engagements (shares, likes and comments) with articles about Fake News we can see a very significant increase in November 2016. One of the superpowers that all journalists and marketers would love to have is being able to predict popular trends. When we look back at Fake News content, we can see some early signs that it was about to become a major issue. It can be argued that if Trump had not been elected in 2016 there would not have been such an explosion in stories about Fake News, but there were signs that it was about to become a matter of significant interest. The number of articles in the run up to the election may have been small but they were rising and so was the social engagement, Below we have broken out these articles along with the level of social engagement. By October 2016 the number of articles published about Fake News grew to 442. The level of social engagement was also rising sharply. The top post by CNN on ‘the plague of Fake News’ and ‘how to protect yourself’ gained over 127,000 social engagements. It would have been difficult to predict the extent of the explosion in articles about fake news in November but as we can see interest in the topic was growing. The number of articles being published was increasing and there was sharp increase in social engagement with those articles. 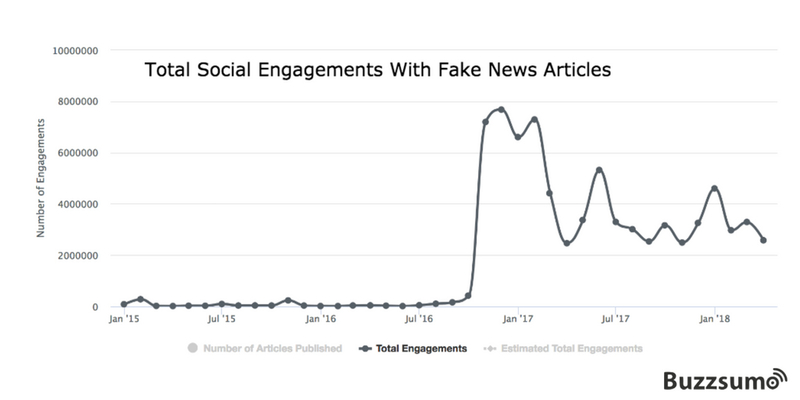 In December 2016 there were over 19,000 articles published about fake news (remember that’s compared to 238 in August) and some of these gained very high levels of social engagement. The post which received the most engagement was this post by NPR on how to self-check facts, with over 420,000 engagements. There’s no doubt that mainstream news sources covering the topic helped with its virality. Fake news continues to generate interest and social engagement. In February 2018 the Independent’s coverage of a University of Oxford study showing that Trump supporters share proportionally more fake news stories gained over 120,000 social engagements (many of which were no doubt negative responses from Trump supporters). Track speed of social engagement: The true story is not just about the volume of articles published on fake news. It’s how quickly the early stories built social engagement. This is a good indicator of how the topic is resonating with the audience. You can use tools like BuzzSumo to track how engagement is increasing. You can track specific networks and track both total and average social engagement. Track the relevant trigger events. Each topic tends to have a trigger event which causes a surge in interest and in articles. In politics these events are typically elections. In the case of topics such as Bitcoin it is the price. 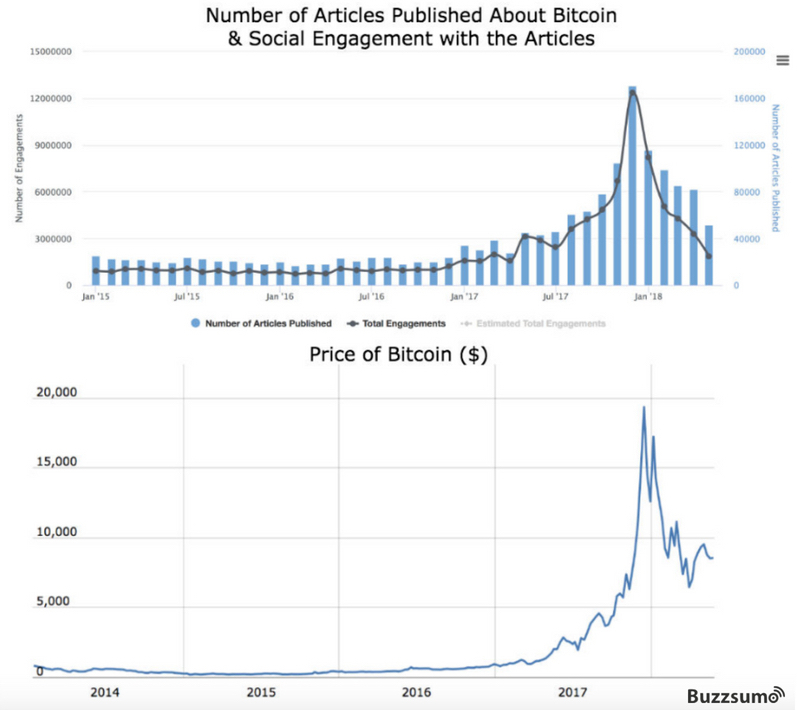 Interest in Bitcoin as measured by articles and social engagement closely follows the price of the cryptocurrency as we can see below. After the price of Bitcoin went above $10,000 there were over 160,000 articles published about Bitcoin in December 2017. Monitor mainstream outlets: Time, NPR and Washington Post were all relatively early to publish articles on Fake News. Monitoring articles from key sources filtered by terms like “Fake News” on a daily basis using BuzzSumo or Anders Pink can help you stay on top of trending topics from key publishers. Be the first data researcher: Buzzfeed’s article did very well, not because it was another opinion piece on fake news, but because it was data-driven research on the phenomenon. Original long form research backed with evidence helps you build authority early in a trend’s social lifecycle. It also lays the groundwork for subsequent content with examples and advice. Be helpful and provide advice: The next step after spotting a trend is to be the best answer to these questions: Is this bad? What should I do about it? CNN and NPR’s articles on how to protect yourself was well shared because they’re practical “how to” content. We can see similar patterns in other trends like Bitcoin and AI. Being the best answer to “so what do we do about it?” is a good place to be as trends take hold. Know when you’ve missed it: Our natural tendency when looking at these trends may be to wade in to try and catch the wave. Think twice before putting in the effort. The trend may be past saturation point. For example in the 6 months Nov 2017 – a full year after the election- to May 2018 over 78,000 articles were published on Fake News. The trend is now in decline from a peak in January, though recent Facebook revelations have given it a second wind. Maybe we have missed the boat with this post but we hope the use of original data and key charts may generate some traction. Is my audience already saturated on this topic? If so, will yet another article add or detract from my goals in building authority? In other words: If the trend has already jumped the shark, or everyone’s drowning in content, don’t try and catch the wave…that’s true news, folks.